The use of chainsaw has been increased considerably in different fields. A chainsaw is basically a portable, mechanical saw which is powered by electricity, compressed air, hydraulic power and most commonly a gasoline two-stroke engine. We have selected this article in order to discuss some best ECHO chainsaws. This is considered as one of the fastest and powerful chainsaw that has been designed to perform different functions smoothly. 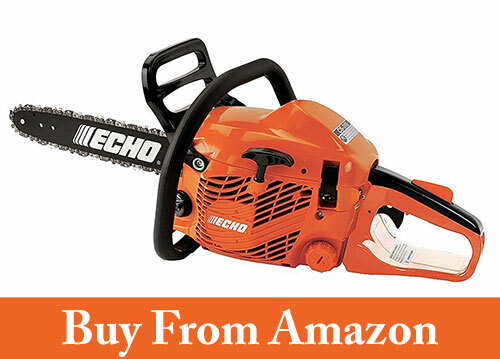 This ECHO CS-590 chainsaw is more powerful than the Stihl Farm Boss and Husqvarna Rancher. The most important thing about this chainsaw is that it has decompression valve that has been designed for improved and easy starting of this chainsaw. This product also comes with 5 year consumer warranty. This chainsaw has been equipped with advanced features and specifications. The item weight of this product is about 20.1 pounds and shipping weight remains in the range of around 20.4 pounds. Originally made in USA, this product has item model as CS-590. This chainsaw also has 59.8cc professional grade engine, heavy duty easy access air filter, decompression valve that ensures the easy starting. This chainsaw also has auto oiler system that also improves the working efficiency of this chainsaw. The engine of CS-590 is identical to the CS-600 but the only difference between CS-590 and CS-600 is that the CS-600 has an aluminum handle, a pro bar with a replaceable nose and a clutch drum that takes a replaceable rim sprocket. The CS-590 has a plastic handle, laminated bar with non-replaceable roller nose, and a clutch drum with attached sprocket. The air filter of CS-590 works great due to a pre-filtering system and this thing also improves the efficiency of both the filter and the machine. Another important thing about this CS-590 chainsaw is that no tools are required to access the air filter and spark plug and the transparent gas tank is convenient to see the fuel level. Its fantastic vibration control also improves the working performance of this chainsaw. It is easily possible to handle it due to its great format, size and weight. 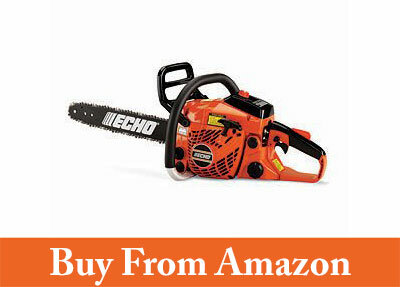 This is also considered another latest Echo chainsaw that comes with different important features and specifications. This chainsaw has automatic adjustable oiler and inertia type chain brake. These things improve the efficiency and performance of this chainsaw. The total item weight of this chainsaw is around 8.1 pounds and shipping weight is around 15 pounds. As we mentioned above that this chainsaw has been blessed with different important features and specifications. The CS-310 top handled chainsaw is ideal for cutting through larger tree limbs and branches up to 10 inches in diameter. The presence of top handle has made it more user friendly and users can feel flexibility while making cuts at difficult angles. This chainsaw has been blessed with powerful 32.6cc engine and this powerful engine provides ample power to the 14 inches bar and chain. The CS-310 chainsaw also has G-Force Engine Air Precleancer which ensures long engine life and extended maintenance intervals. This chainsaw also has side access chain tensioner and lanyard ring for professional application. This chainsaw is backed by five years consumer warranty. This chainsaw is easy to start and easy to handle during jobs due to its low weight. With this smaller and lighter chainsaw, you can easily and comfortably reach most of the limbs with little stress or strain. Its powerful engine also ensures difficult tasks to be done without any problem. This chainsaw is also considered another important and advanced chainsaw that comes with different improved and enhanced features. This chainsaw has been blessed with 40.2cc powerful engine and 18 inches bar and chain. The engine of this CS-400 chainsaw is easy to start and it can be handled easily. The item weight of this product is around 10.1 pounds while shipping weight is 16.2 pounds. It is said about this chainsaw that this lightweight but powerful chainsaw will handle tough chores. This chainsaw has been blessed and equipped with easily adjustable chain and removable air filter that makes maintenance a breeze. Its powerful engine s easy to start and it can perform different tasks easily due to its long chain and bar. The performance of this chainsaw improves with the quality of the gas used to run it. This chainsaw is much better than the other chainsaws like Poulan, Mccullocj, Homelite and Stihl. Its lightweight, nice and delicate balance and fairly quiet starting make it different from other products of the same category. This chainsaw also comes and is backed by five years consumer warranty that also provides ease of mind during operating this chainsaw. The company believes that this chainsaw is excellent with lots of power and can do heavy cutting to light cutting. 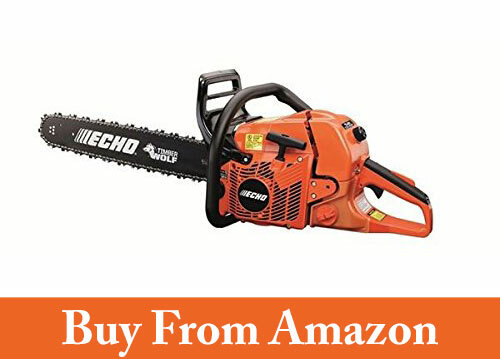 This 20 inches Echo chainsaw is also considered an important chainsaw that comes with different latest and improved features. The company is quite hopeful about this product as it has been equipped with latest features. The item weight of this chainsaw is around 10.6 pounds and shipping weight normally remains in the range of 17.1 pounds. This chainsaw has powerful 50.2cc engine that improves its efficiency to great extent. The bar length of this chainsaw is around 20 inches which makes it possible to perform difficult tasks. As we mentioned above that this chainsaw has been equipped with powerful engine, it also comes with auto / adjustable chain oiler. 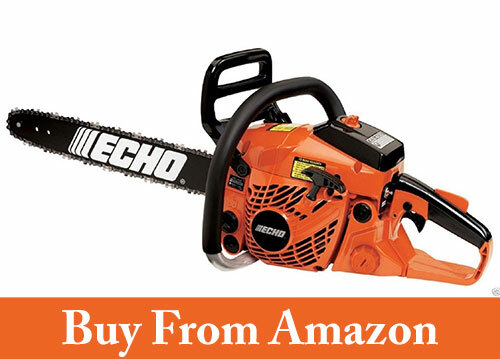 Echo CS-500P chainsaw has anti-vibration handle that improves the grip over this chainsaw. This chainsaw has fuel tank capacity of around 16.9 oz. Due to its tremendous power and long bar, it can be placed even in rough and difficult to reach places and it can easily cut the trees and or branches of trees in a better way. This chainsaw is also paired with Oregon chain which is super sharp and is more operative than other available chainsaws of the same category. This chainsaw is also blessed with different important and improved features. It has been used both for domestic as well as commercial purposes. The Echo CS-370 comes with different latest and enhanced features. This chainsaw has been blessed with an efficient and powerful 36.3cc engine and this engine improves the performance and durability of this chainsaw. This engine shows fewer emissions than the standard. The most interesting and important thing about this CS-370 chainsaw is that that it comes with G-force engine pre-cleaner that spins out dirt prior to air filtration and this thing improves the efficiency and life of this chainsaw. It has also been blessed with I-30 starter which requires 30% less pulling effort. The item weight of this product is around 10 pounds and its shipping weight is also around 10 pounds. The engine of CS-370 is certified to the highest durability rating in the industry by the E.P.A. Its Pro-fire electronic ignition makes sure that the engine starts fast. Another important and improved thing about this chainsaw is that it has narrower bar and chain design that makes cutting 30% easier than the standard bar and chain width. An automotive style heavy-duty air filter and G-Force Engine Air Pre-Cleaner protects the vital parts of the engine from harmful dusts and other objects. All these things collectively increase the efficiency and performance of this chainsaw. 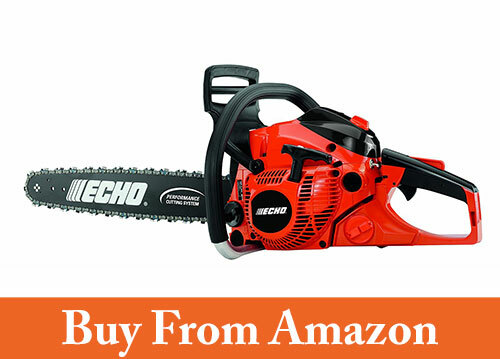 How Echo chainsaw can be useful for you? There are different companies in the world which are manufacturing chainsaws and all the models of chainsaw come with unique features and specifications. It is basically used in different activities such as tree felling, limbing, bucking, pruning, by tree surgeons to fell trees and remove branches, to fell snags and assist in cutting firebreaks in wild land fire. There are also other chainsaws that have been designed for specialized purposes like cutting concrete, cutting ice etc. As far as the mechanism or construction of chainsaw is concerned, a chainsaw basically has four main parts or components. They include the engine, drive mechanism, guide bar and cutting chain. Engine of chainsaw is always a two-stroke gasoline internal combustion engine which produces more power and drive mechanism comes in the form of a centrifugal clutch and sprocket. A guide bar comes in the form of an elongated bar with a round end of wear-resistant alloy steel and cutting chain features small sharp cutting teeth.